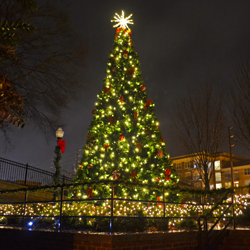 CITY OF KENNESAW CHRISTMAS TREE LIGHTING: November 27th, from 6 to 7pm. at Depot Park, 2829 Cherokee St. NW, Kennesaw, GA 30144. Winter in Kennesaw is a season filled with exciting activities and time-honored traditions and the Christmas Tree Lighting Ceremony is one of them. Join the Mayor and other City officials as they “flip the switch” to light the official Christmas tree of Kennesaw. The program will include free holiday choral music and sing-along, light refreshments, and holiday cheer.